2Bedroom Apartment Onslow Gardens South Kensington in London is an apartment building. Situated 1.1 km from Natural History Museum and 1.1 km from Victoria and Albert Museum, 2Bedroom Apartment Onslow Gardens South Kensington is located in Kensington and Chelsea district of London. The Royal Albert Hall and the Harrods are within 1.5 km and 1.5 km of the apartment, and free WiFi is provided. The apartment has 2 bedrooms, a living room, and a kitchen with a dishwasher. The apartment also provides guests with 2 bathrooms. Guests can relax in the garden at the property. Stamford Brid...ge - Chelsea FC is 2 km from the apartment, while Hyde Park is 2.5 km away. The nearest airport is London City Airport, 19 km from the property. 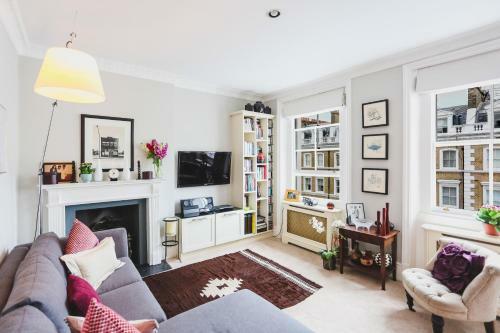 Situated 1.1 km from Natural History Museum and 1.1 km from Victoria and Albert Museum, 2Bedroom Apartment Onslow Gardens South Kensington is located ...in Kensington and Chelsea district of London. The Royal Albert Hall and the Harrods are within 1.5 km and 1.5 km of the apartment, and free WiFi is provided. The apartment has 2 bedrooms, a living room, and a kitchen with a dishwasher. The apartment also provides guests with 2 bathrooms. Guests can relax in the garden at the property. Stamford Bridge - Chelsea FC is 2 km from the apartment, while Hyde Park is 2.5 km away. The nearest airport is London City Airport, 19 km from the property. When would you like to stay at 2Bedroom Apartment Onslow Gardens South Kensington? A damage deposit of GBP 300 is required on arrival. This will be collected as a cash payment. You should be reimbursed on check-out. Your deposit will be refunded in full in cash, subject to an inspection of the property. This property will not accommodate hen, stag or similar parties.